Connect to your Airbnb Wi-Fi network. 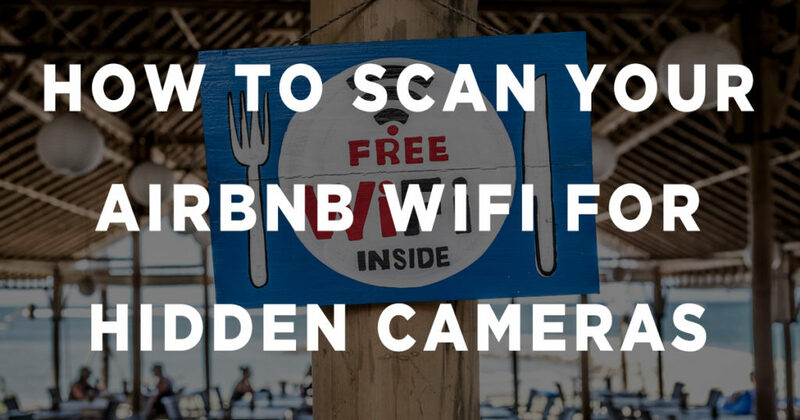 Using your smartphone, tablet or computer, use one of the Wi-Fi scanners below and launch the network scanning function. Use the LAN Scanner or LAN neighbors function to identify other devices on the network. Many devices will show their name in the list. This may already identify if there are cameras on the network. Now that you have a list of the IP addresses of devices on the network you can either click through each IP address in the app if it allows you to connect, or you can copy each IP address to your web browser. Many cameras will have web administration pages where you can view their video and/or configure them. Use the free Fing App to identify connected devices, troubleshoot network and device issues, detect network intruders and run Wi-Fi and internet speed tests anywhere. Fingbox is available for Android and iOS smartphones and tablets, Kindles, and Windows, Mac and Linux computers. Network Analyzer Lite is a lite version of Network Analyzer – an advanced tool for network diagnostics, LAN scanning and problem detection. Network Analyzer Lite can help you diagnose various problems with your wifi network setup and Internet connectivity thanks to the tools it provides. It is equipped with a fast wifi device discovery tool, including all the LAN device’s addresses and names. Further, arbitrary device’s reachability can be tested with the provided ping tool. Finally, it displays various useful information related to your wifi/cell connection. A full-function WiFi scanner and connection manager for Android. A free network scanner for Mac, Windows and Linux computers. View real-time status of your Wi-Fi access point or router. Detects other networks, signal levels, channels. Check the configurations, security and passwords of your WiFi network.